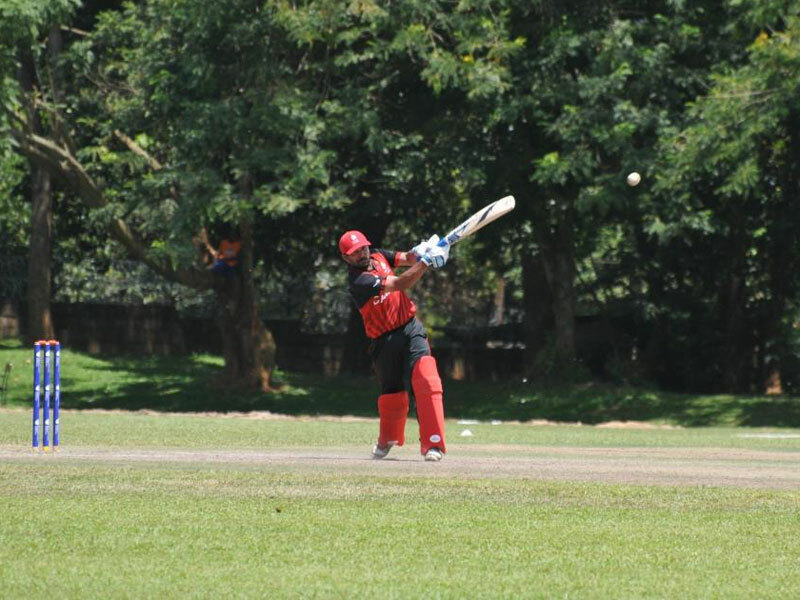 Pathirana has been the mainstay of Canada’s middle order in the ICC World Cricket League Division III tournament// Alvin Bagaya. CRICKET. Canada scored another 70-plus opening partnership at Kyambogo Cricket Oval in the derby between two captains and good mates Nitish Kumar of Canada and Steven Taylor of USA. Bhavindu Adhihetty 67(93) and Nitish Kumar 30(38) blunted the USA opening attack of Timroy Allen and Elmore Hutchinson crossing the 50 run mark in the 11th over Adhihetty having hit Allen three boundaries off three balls in the tenth over; the introduction of spin finally paid off when Kenjige had Kumar caught by Taylor with the opening stand at 74. The industrious Dhanuka Pathirana 87(94) was at it again, posting 64 for the third wicket with Adhihetty, the middle order lynchpin, taking his time to get off the mark but took on Thimil Patel for back-to-back boundaries in the 29th over to get into the scoring groove. Pathirana has been the mainstay of Canada’s middle order in the ICC World Cricket League Division III tournament. The inconspicuous Pathirana has proven to be one of the most valuable players in the tournament. His 87 runs here proved the difference between the sides on the day. USA didn’t have the best start to their innings, with Taylor bowled by Dhindsa and Dodson run out by Hansra. Camilus Alexander 18(40) put on 54 for the third wicket with Ibrahim Khaleel to help USA recover before he was trapped LBW by Cheema. Cheema run through the middle order and when Timroy Allen 24(17) and Thimil Patel 25(44) put on 37 for the seventh wicket. It was only a matter of when and not if Canada would win, Dutta picking last wicket to fall in the 43rd over. At Entebbe Cricket Oval, Oman won the toss and elected to field in a match that had a brief rain delay at the start of the innings. Singapore openers struggled to get going but the reliable Anish Paraam 34(73) and Chetan Suryawanshi 30(46) put on 48 for the fourth wicket to dig Singapore out of trouble. Mohammed Nadeem and Khawar Ali picked the two set batsmen and this was followed by a quick collapse by Singapore when Bilal Khan, who had picked the top order, swept through the tail to wrap up the Singapore innings for 100. Oman made a false start losing Khawar Ali and Jatinder Singh for ducks but Sultan Ahmed 32(55) and Ajay Lalcheta 37(57) made light work of the post-lunch session moving along at the required four runs per over. Oman was never in any trouble with Sultan scoring four boundaries and Lalcheta preferring to rotate strike, Oman eventually getting home in 24.1 overs. Oman will be travelling from Entebbe safe in the knowledge that they bagged the two points while having made some running repairs to their net run rate and qualification may just be a good innings away in their last round robin game today.